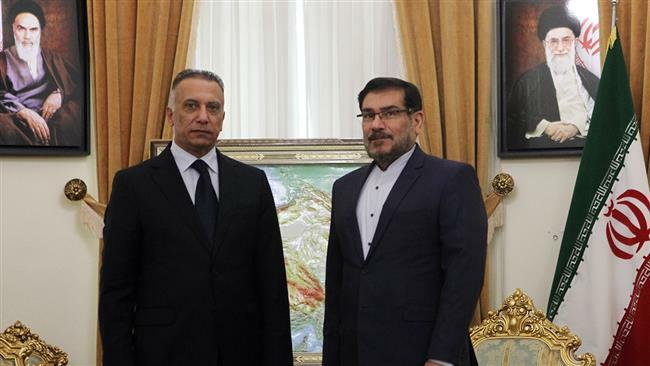 A senior Iranian official has dismissed as a “big lie” claims that the West is playing a role in keeping the Middle East region secure. “The claim about the West’s contribution to the establishment of regional security is a big lie and its bloody and costly results can be seen in many countries in the region,” Secretary of Iran’s Supreme National Security Council (SNSC) Ali Shamkhani said in a meeting with the head of Iraqi National Intelligence Service, Mustafa Kadhimi, in Tehran on Sunday. He added that the Iraqi army, backed by popular forces, have managed to make continued achievements in the fight against Takfiri terrorism and the elimination of Daesh terrorists from many areas in the country. Shamkhani said continuation of military gains by the Iraqi army would prompt terrorists to increase their activities against the security of the country, which requires security and intelligence services to play their important role in managing the new conditions. The senior Iranian official further said Iran and Iraq enjoy great potential to boost economic, political, security and cultural cooperation. He added that continued consultations between senior Iranian and Iraqi officials can play a key role in thwarting the enemy plot to partition and undermine Muslim countries. For months, Iraq has been preparing for the assault on Daesh in Mosul, which fell into the hands of the terrorists in 2014. Government forces have managed to recapture all the other places that Daesh had seized, with the last major one being the city of Fallujah, which was liberated in late June. The operation for Mosul is highly significant as estimates say about half of the city’s pre-war population of two million still remains there. Based on available intelligence, Daesh has between 4,000 and 5,000 terrorists in the city, making the situation more complicated. Gruesome violence has plagued the northern and western parts of Iraq ever since Daesh terrorists mounted an offensive there more than two years ago, and took control of swathes of Iraqi territory. The militants have been committing heinous crimes against all ethnic and religious communities in Iraq, including Shias, Sunnis, Kurds and Christians. The Iraqi official, for his part, praised Iran’s influential role in fighting terrorism and boosting regional security and stability, saying that the Islamic Republic’s success in the campaign against terrorism and the establishment of security inside the country and at its border areas showed the unparalleled success of Iran’s security example. Kadhimi added that further exchange of intelligence and cooperation between regional countries for the elimination of terrorist groups constitute an inevitable approach, which must be adopted by those countries.